If you're after a life-enhancing activity with purpose, you can't do much better than a cookery course. Time was you had to go abroad to learn how to cook but no more; the UK arguably has some of the best – and best-attended – cookery courses in Europe. Whether you're a keen amateur or don't know your béchamel from your bouillabaisse, here's our round-up of some of the best cookery schools in the UK, offering both residential and day courses. One of Britain's best-known places to learn to cook, this place offers over 40 different courses, and is a lovely place to stay – on the edge of Dartmoor in Devon and with 14 lovely rooms for students. They run half-day and day courses, but the weekend and five-day courses are best – everything from a beginners cookery weekend to a whole week on patisserie. With two locations in the heart of London's West End and The City, the great thing about Atelier des Chefs isn't the gleaming kitchens or wonderful cookware shop in the basement, but the wide range of courses they offer, and the fact that you get to do as much or as little as you like – from their great-value 'half an hour lunch specials to more in-depth four-hour classes. Their gift cards make a perfect present, too. What makes Billingsgate isn't just the fact that it's focused on fish and seafood but that it's upstairs from London's main wholesale fish market, and many of its courses start there, browsing and selecting what you're going to cook. Being a fish course, a lot of the focus is on preparation and knife technique (skills you'll have for life) but you also get to cook – and eat – some delicious fresh fish too. Three hour courses from £65. The only purely Italian cookery school in central London, run by Giancarlo and Katie Caldesi, who don't only teach their native Tuscan cuisine but indeed cookery from all the Italian regions, in exciting, interactive classes that involve everybody. Classes are very hands-on, and you get to cook – and eat – a lot. Come hungry. It's foodie heaven at this gorgeous timbered country house hotel that just happens to be situated on a working farm and have its own cookery school to boot. A brilliant range of courses half- and whole-day courses, ranging from making the most of your Aga to streetfood, pies and classic French cuisine. You get to use the wonderfully fresh ingredients form the farm and of course have a good excuse to stay at the hotel and eat in its wonderful restaurant. Food is at the forefront at the Mistly Thorn, a relaxed Essex riverside hideaway that encompasses a very reasonably priced restaurant with rooms with its own kitchen shop, wine merchant and cookery school – the Mistly Kitchen – in the building next door. Run by ex-pat American and Essex devotee Sherri Singleton, they run regular small-scale cooking workshops in a purpose-built kitchen – knife skills, lots of stuff for kids, Italian cuisine and on-trend vegan cooking. 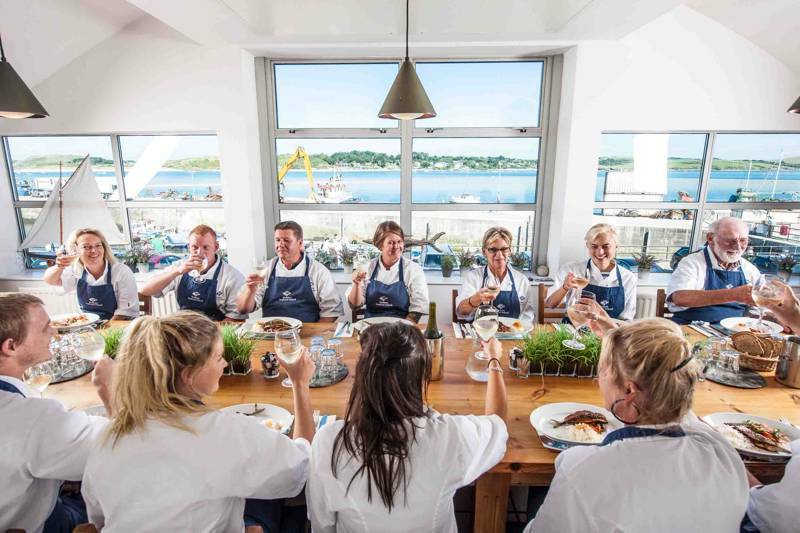 Another fish specialist, budding seafood chefs will be in their element at Rick Stein’s acclaimed ookery school, which overlooks the quay in Padstow where much of the seafood is hauled in. A range of courses – usually between one and four days – cover a variety of skills and cuisines, such as Far Eastern, Mediterranean, Italian and French. Happily, tasting is all part of the learning process. Baking and children's cookery are available too. Hugh Fearnley-Whittingstall’s River Cottage is a shrine to all things culinary, with cookery courses just one of a range of things on offer – a variety of food-related workshops and courses including breadmaking, cheese-making, bee-keeping, foraging, meat-curing and booze-making, among many others. Their Friday to Sunday dining events start with a tractor trip down to the farm itself, followed by canapés, a talk with the chef and a set course meal. The cookery school of this celebrated North Yorkshire country house hotel makes its base in the hotel's converted Georgian stables and is an integral part of the estate, with a four-acre walled garden (the largest hotel kitchen garden in the UK) providing much of the fruit and veg while the estate itself offers game, fish, rabbit, venison and the like. There's a huge range of courses on offer – from curry clubs and butchery skills to gourmet weekends and wine tastings, foraging walks, and children's and family cookery courses.